Notwithstanding the challenges in the unitary cooling segment in the quarter gone by, both companies have all that it takes to bolster their fundamentals in the long-run. 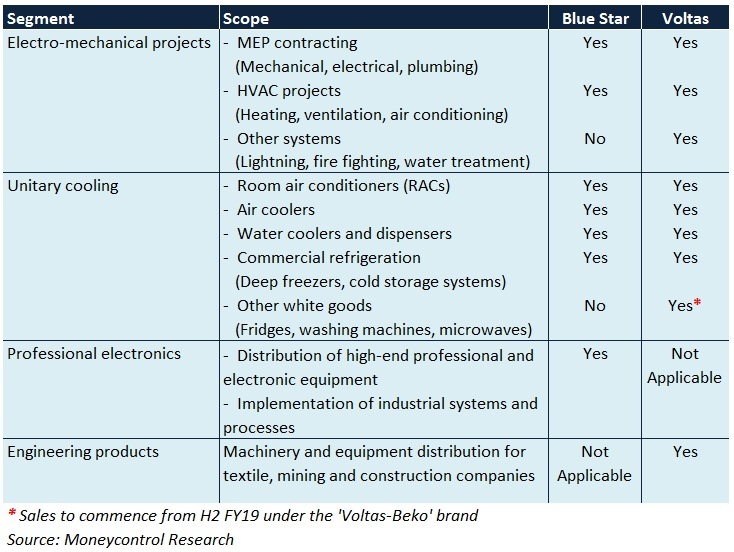 Blue Star and Voltas cater to a wide range of clients through their diversified product/service portfolio, particularly in the fields of cooling and engineering. The unitary cooling segment of both companies faced a tough time in what was supposed to be a seasonally strong quarter. Unseasonal rains, weak summer conditions and a high base last year (preponement of purchases before implementation of the Goods & Services Tax in FY18) led to a dip in revenue and margin. In contrast, their electro-mechanical segment reported healthy topline growth and margin expansion. This was largely on the back of increased demand for products/systems used in heating, ventilation, and air conditioning (HVAC) and mechanical, electrical and plumbing (MEP) projects, cost efficiencies and selection of contracts with a robust margin profile. Blue Star’s professional electronics segment, despite witnessing strong traction from healthcare clients, was a laggard owing to an unfavourable product mix. For Voltas’ engineering products segment, GST complexities impacted textile machinery sales. In mining and construction equipment, operations in Mozambique drove performance. Inflows from government contracts, urban infrastructure projects (airports, metros, malls, hospitals and hotels), technology and healthcare clients will be crucial. New orders may be finalised during the course of the year, as evident from the increase in the number of enquiries from prospective clients. This is subject to signs of a recovery at the infrastructural and industrial level. Going forward, only projects in line with the stipulated threshold limits and commercial guidelines will be selected to keep margin intact. Voltas is also bullish on securing new contracts in areas pertaining to electrical distribution and water treatment. Improved sentiment in the Middle East, Expo2020 (UAE) and FIFA World Cup (Qatar, 2022) could provide it a chance to bag big-ticket contracts. Sale of split inverter room ACs, which fetch higher realisations compared to regular ACs, will be prioritised to facilitate margin accretion. Unsold AC inventory during Q1 FY19 is likely to be gradually liquidated over the next 3-4 months. This, in turn, should ease the current strain on working capital. The second half of the fiscal typically tends to be good for consumer durable majors owing to festive season boost. This could possibly help offset the subdued demand in H1. 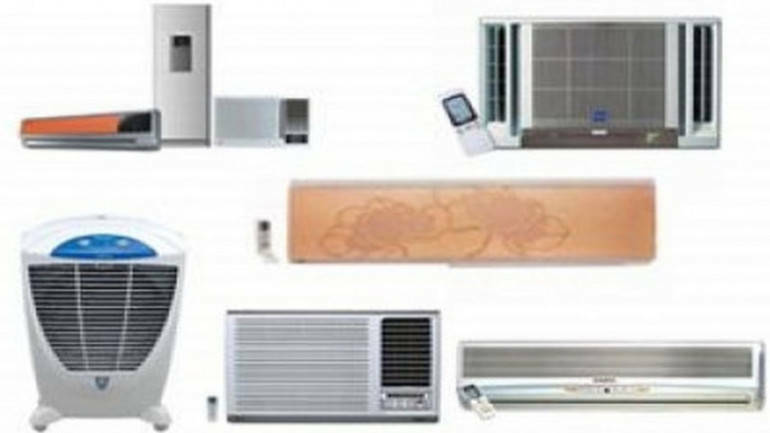 To save costs, emphasis may be laid on domestic procurement of raw materials (except compressors, that are generally not manufactured in India) used in indoor AC units as against imports. Strong traction has been observed in the commercial AC domain too. This category covers dispensers, water coolers, water purifiers and refrigeration (kitchen and medical). For Blue Star, water purifiers will be among the key topline drivers. To achieve a sales target of Rs 100 crore by FY19-end, the management plans to augment product reach from 2,050 to 3,600 outlets. Voltas, by virtue of its joint venture with Turkey-based Arcelik AS, will launch refrigerators, washing machines, microwaves and other kitchen goods under the Voltas Beko brand in H2 FY19. Air cooler sales, that were severely impacted because of an inventory build-up at the dealers’ end in Q1 FY19, should normalise in due course. Private sector capex is still sluggish in India, thus making it difficult to vie for orders from new clients. Unforeseen changes in the government’s policies could impact the order book as well. Inabilities to clear order backlogs due to delayed executions may lead to revenue deferment. For Voltas, geopolitical risks in the Middle East and a downtrend in crude prices (and its resultant toll on the region’s economic activity) could be a cause of concern. FY19 will be a dull year for AC sales as a whole because of subdued momentum in an otherwise seasonally strong Q1. Competitive pressure will continue to prevail in ACs, thus making it hard to pass on the entire input cost increase (including the effect of rupee depreciation versus the dollar on imported components) to the consumer. The manufacturing facility for Voltas Beko products in Sanand, Gujarat will involve a capex of Rs 240 crore and additional outlays on marketing and higher dealer margin. Therefore, achieving profitability on this front will be difficult by FY19-end. Blue Star’s professional electronics segment, despite not constituting a big chunk of turnover, has not been able to break-even for quite some time. In Voltas’ engineering products segment, mining/construction equipment sales in India are not picking up. Textile machinery sales are also likely to remain affected because of GST intricacies and high cotton prices. 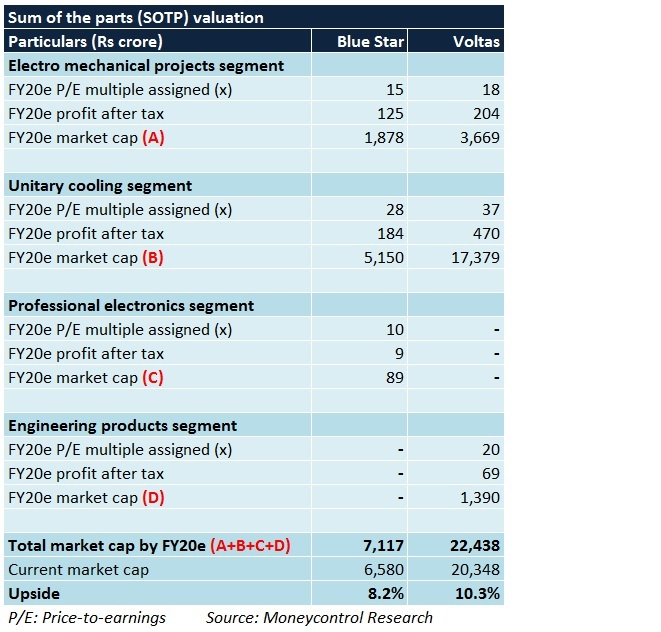 Notwithstanding the challenges in the unitary cooling segment in the quarter gone by, both companies have all that it takes to bolster their fundamentals in the long-run. These include a strong brand name, a wide product portfolio, diversified presence across varied businesses, strong order visibility in electro-mechanical assignments and an extensive network. Blue Star and Voltas’ valuations seem to capture most of the moats, thus limiting the short-term upside. Both stocks have been range-bound for most part of the last 2.5-3 months, underscoring the fact that there has been a time correction of sorts in the recent past. We advise investors to go long on these consumer durable names from the medium to long term investment horizon.